Robin Williams’ eccentric excuse to bounce around the silver screen side to side with a comical green bloc is a remake of the 1960’s hit The Absent Minded Professor (starring Jerry Lewis). It was great then, and it’s great now. Phillip Brainard (Williams) can be described perfectly using the title of the 1960’s film – yes, a very absent-minded professor. Though he is unmistakably brilliant in his own demented way, Phillip has invented many remarkable and ground breaking gadgets in the name of science. The only fault in his phenomenal mind is that the science of daily life eludes him. So after forgetting to attend his own wedding on two separate occasions, finance Sara Jean Reynolds (Marcia Gay Harden) has chosen to forget about her first two attempts at marriage and gives Harry a third-time-or-nothing deal, vowing that she will not marry him unless he attends the wedding at 6:30 in the evening. But that night Phillip, accompanied with flying robot invention “Weebo”, stumbles across the most amazing of his discoveries yet. In the form of a gooey green substance, the flying rubber (hence, Flubber) which he has created almost seems to have a personality and life of its own. As Phillip’s watch alarm rings, he breaths a sigh of relief – its only 6:30…the next morning. From then on Phillip and Flubber are on their own and get tangled up in many comical adventures including applying energy to the local basketball team, taking care of a couple of dim witted goons and giving the car and air born up date. Whilst this is taking place, Phillip fights to win his woman back and save where he teaches from being shut down. Flubber is great fun. Robin Williams’ physical manoeuvres are alone worth seeing; and the collection of scenes which make up this radical experience are high quality entertainment. The kids will have a wonderful time jumping, shouting and pointing at Flubber’s amusing antidotes whilst adults will have no problem in twisting their faces into a cheerful smile and appreciate the more subtle jokes. 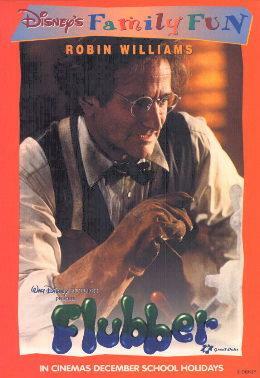 Flubber has got to be one of the most enjoyable films I’ve seen this year. Easy going, stress free and awesome fun for young and old.